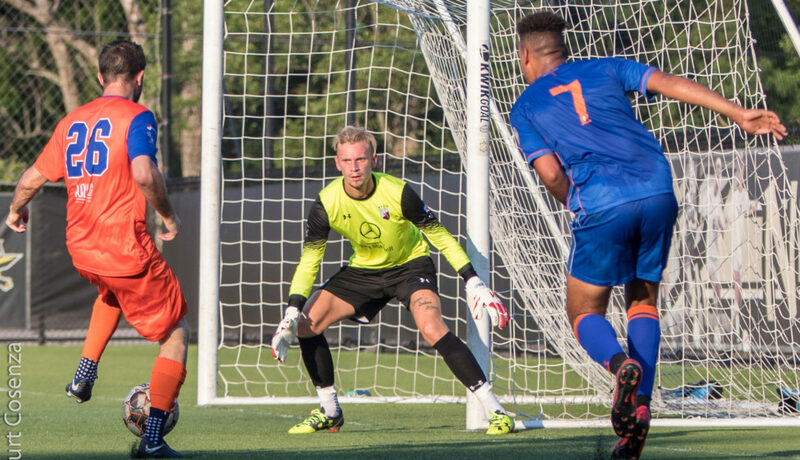 Dayton, July 21 2018 - Two games before the end of the season Cincinnati Dutch Lions FC’s defense only got scored on 10 times in 12 games, the least amount of goals in the whole Conference. Besides the strong defense part of that also had to do with goalkeeper Wesley Storm, who was signed from FC Lisse (4th division) from the Netherlands. After a difficult start (2 points in the first four games) the team worked their way up to 2nd place in a strong Great Lakes Conference, but in the key match up vs n1 Dayton Dutch Lions FC the team unfortunately lost 4-0. We asked Wesley about his experience playing in the USA and for Cincinnati Dutch Lions FC. Why did you choose to become a goalkeeper? Honestly, I never choose to be a goalkeeper! My first training session (when I was 5 years old) I was still kciking the ball, the second session my parents bought me some gloves and I became a goalie, I think I’ve never played a game as a player on the field after that. How did you get to play for Cincinnati Dutch Lions FC? I read something on Facebook about playing college soccer in the US. I wanted to know more and came in contact with an organization that can help you play college soccer. In my case the person I talked to told me it wold be difficult for me to play college soccer as far as eligibility, and advised me to contact Erik Tammer of Dutch Lions FC. We had a conversation and Erik came to watch a one of my games at FC Lisse. After the game he asked me if I wanted to play for Cincinnati Dutch Lions FC and I didn’t have to think twice. We came to an agreement and on May 8 I was a CDL FC player. Where did you live during the season? How was that? I lived in an apartment in Florence. I shared the apartment with a teammate and all the other players who came from another state stayed there. In total we had 13 players in the apartment complex. The apartments where built only 2 years ago which is noticable, everything is in perfect shape and it looks really good. We had a really good time here because you get to know the other players easier since we were all living together. What is the biggest difference compared to playing in the Netherlands? There are many differences between playing in Holland and playing in the US. For me the biggest difference was the physicality. In Holland we are more used to play the ball on the ground. The way CDL FC played was also more the way we play in Holland, because we tried to build up from the back as much as we can and use the wings. If you compare that to our opponents that was a big difference, I think that’s also a key reason for our success this season. How was it to play for Paul Nicholson, a veteran player, and experienced coaches such as Jack Hermans, Terry Nicholl and Brandon Ponchak? I’ve enjoyed every minute with our coaching staff. Paul has a lot of experience on the field and he brings that over to our players very well. Also, he can motivate us for every singe practice session and game, for me he is a really good coach. Brandon helped me a lot with understanding our opponents, and the way Americans are used to playing, I learned a lot from that. Terry helped me a lot with building my confidence in the team and made me a stronger person then I was before. Jack did the most of our technical drills in practice, you can see that he has a lot of experience in coaching and I think several players on our team really improved their skills. I really appreciate everything our coaching staff did for me and I hope we can work and build on things we have started this season towards next season again. How do you look back on the 2018 season? I personally look back on a successful season, unfortunately we didn’t make it to the play offs but we were in the race for a post-season spot until the last game. We had a slow start of the season looking for our best system, once we found that we had a fantastic run. We grabbed points in almost every game, played good soccer, scored a lot of goals and we conceded almost nothing. For me personally it was a good season as well, I played every game, except for the first two games because I wasn’t eligible to play yet. I learned a lot of things and improved on the things I wanted to work on. What was the highlight for you in the season? I had a lot of highlights this season, but the best one was probably the away game against Dayton. For me it was the best game I played this season, I didn’t make a lot of saves that game, like I did in other games, but we defended really strong and it was a turn around in our season. What is your overall impression of the club and it’s ownership? My impression from the club and the ownership is amazing. The club has amazing fans who supported us all season long and I think we made our mark in this year’s PDL. Our ownership has taken care of every single aspect this season. We had our own travel bus, brand new training gear and for me everything I’ve wished for. Also our owners were really close with the team, after every game we met at the House of Orange, talked with them and they invited us on the 4th of July at their house at the lake where we had a really good time. They did everything for us to make us feel at home. My plan for the coming year is to play as many minutes as I can for FC Lisse, and who knows where that will bring me. I think I really improved here and I’m excited to see what the future will bring. We like to thank Wesley for a great season and wish him all the best and hope to see him back as a Lion next year! Copyright © 2009 ‑ 2019 Dutch Lions FC Group. All rights reserved.